Our screw sleeves or screw sockets are compatible with tube studs and high-pressure hoses by all renowned manufacturers of central lubrication units and central lubrication systems. 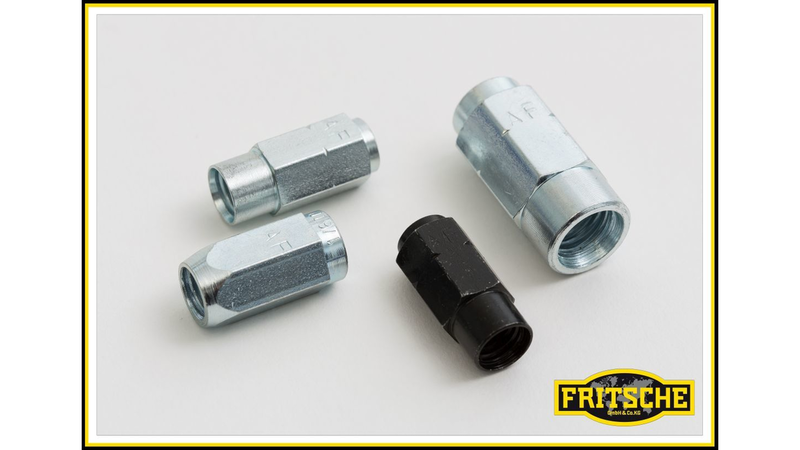 Screw sleeves are used as connecting elements between the high-pressure hose and a cutting ring fitting or a push-in fitting. Connecting these components with screw sleeves results in a pressure-tight, stable and detachable connection. Our screw sleeves are available in various sizes suitable for high-pressure hoses in the following diameters, 4.1 x 8.75, 6.3 x 11.3 and 1/8" x 5/16; they can be supplied in different qualities, e.g. galvanised steel, black chromated steel and stainless steel VA 1.4401/316/V4A.